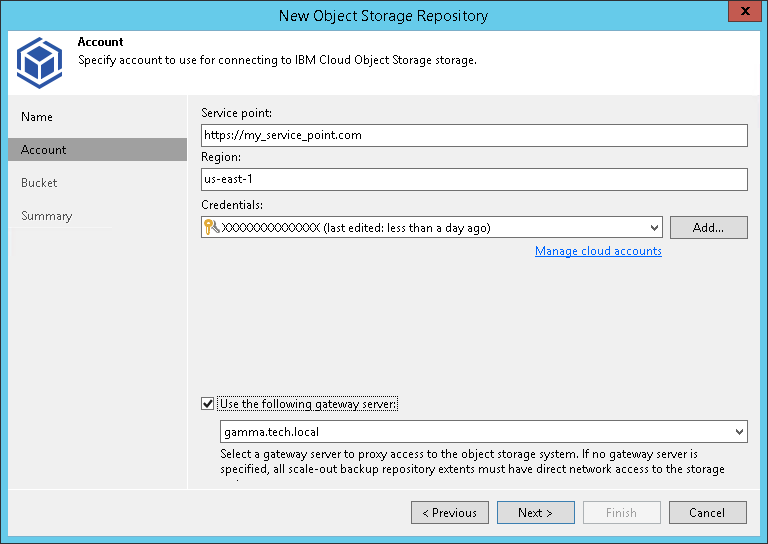 In the Service point field, specify the end-point of your IBM cloud object storage. In the Region field, specify a region. In the Credentials drop-down list, select valid user credentials to access your IBM cloud object storage. If you already have a credentials record that was configured upfront, select such a record in the drop-down list. Otherwise, click Add and provide your access and secret keys, as described in Cloud Credentials Manager. If your organization uses NAT or different types of firewalls and your access to the internet is limited, you can employ a dedicated gateway server to govern inbound/outbound traffic management. You can use either Windows or Linux machine for this purposes. For more information on how to add such a server to your environment, see Adding Microsoft Windows Servers and Adding Linux Servers respectively. To use a gateway server, select the Use gateway server checkbox and choose an appropriate server from the list.